Crime scenes are utterly disturbing, especially if it involves the death of your loved one. Now imagine in this chaos, if you are asked to clean the entire place. It will be extremely overwhelming and traumatizing for you. So, the wise thing to do is resort to the crime scene cleaners. There are plenty of crime scene cleaning services who have well-trained, knowledgeable, and experienced individuals to take care of such situations. The biological residue or the toxic chemicals is not good for the environment and lingering it for too long in one place can be detrimental to the survivors. 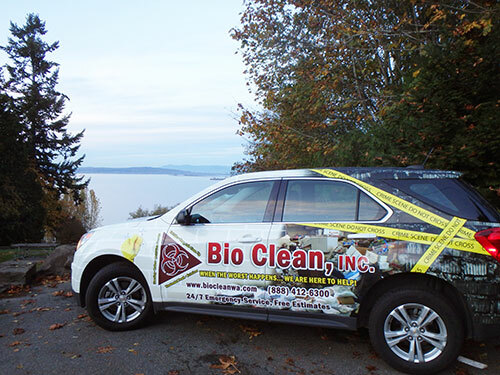 We, at Bio Clean Inc., are the disaster response team you have been looking for. With our expertise and experience in this field, we can restore all kinds of properties, home or office, and help you get rid of the trauma of cleaning the crime scenes. So, if you are from areas including Bellingham, Coupeville, Everett, Seattle, Tacoma, or Washington, you must resort to us. Here, we have put together a few queries that you might have about crime scene cleaning services. Take a look. How can crime scene cleaners help? A crime scene cleaner can properly clean, sanitize, and disinfect a crime scene so as to remove, erase, and properly dispose of any kind of medical waste, body fluid, blood, and other toxic elements found in a crime scene. If you want to get rid of all sources of contamination, deodorize, and restore your property to the original condition, then a crime scene cleaner is what you need. If you choose the right crime scene cleaning service, then they should ideally serve you 24 hours a day 7 days a week because crime scene cleaning requirements are an emergency and can occur without a warning. So, if you think you are interested in hiring us for this job, then quickly call us at (888) 412-6300 now.